Jack Radcliffe is a photographer based in Baltimore, Maryland. 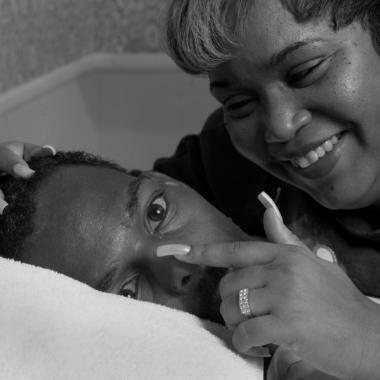 Known for his documentary style, black and white photographs, he has excelled at photo series of family members and friends over a span of time. His images display intimacy allowing the viewer an empathetic connection at once. 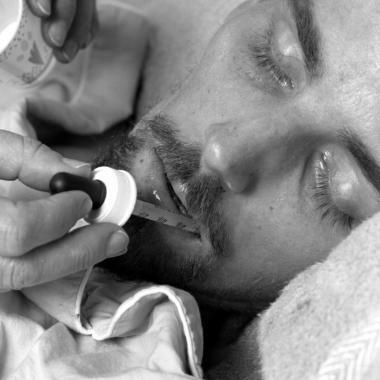 It is no surprise, then, that Jack was asked in 1996 to become a part of an exhibition and book supported by the Corcoran Gallery of Art , entitled "Hospice: A Photographic Inquiry" (Bulfinch Press, 1996). The book incorporates the works of 5 photographers; Jack Radcliffe, Jim Goldberg, Nan Goldin, Sally Mann and Kathy Vargas. Jack acknowledges his fear when first asked to be a part of the project saying, "When I began I wasn't really sure what hospice was. I only knew that it had to do with death." 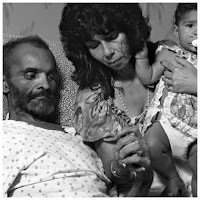 He got in contact with a hospice in York, PA called York House AIDS Hospice and the director Joy Efema granted him permission to come photograph. The York House was a three bed inpatient facility that no longer exists. Primarily taking care of AIDS patients, Jack writes how fortuitous it was to start this project after the death of his own mother, "My mother had just died, and my father was dying. I wasn't dealing at all with my loss. Being with Joy and the nurses at York House - seeing their devotion to patients, both physically and spiritually- helped me to view death as a part of life. It was a cathartic transformation for me, and eventually I was able to grieve for my parents as well as the patients I came to know." When you look through the photographs on Jack's website, you'll find a narrative below the pictures from Barbara Ellen Wood, who was assigned as an intern to keep a journal during the project. I found the little vignettes and descriptions added to the visual story presented. The project took 4 years to complete, and artistically, using just 3 rooms over and over again proved a different challenge for the photographer. Attempting to reveal the relationship with the subjects' environment, without causing the viewer to notice the repetitive background caused Jack to move in closer and change perspective, which ultimately changed his long term photographic style. 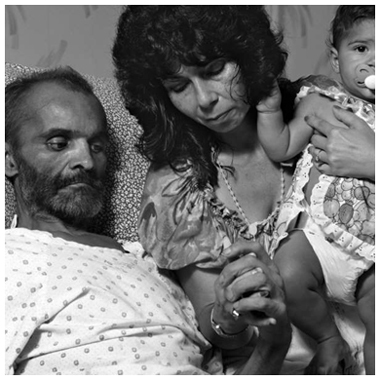 While his images, which were taken over a decade ago, should be overly familiar to us in palliative care, I found myself touched and moved more than expected. Perhaps these photo's actually allow me to step back and feel the emotion captured more than my typical myopic view in the midst of daily work.